thanks Bump but isnt the motor different.. i read some where here that someone found 3tenths of a second a lap difference with the sport motor? Everyone says the motor is the same except its has a little sticker wrapper thingy that says "Sports". Its the rear axle and bearings that are better, an additional button magnet and the packaging. You may well see a faster lap whereas a few people don't see much difference at all. My personal preference is to get the Sports version if its available. I think for the race, we are preferring people have the standard version, and not the sport version. As bump said there hard to find, but if sport is all someone can get there hands on im sure we can work something out. If anyone is un-sure about racing, give it ago, I haven't even used a camaro or a mustang and ill be there giving the race ago for some fun, and as a chance to meet some of the forums members. Just a question on the button magnets. Some of us do not have any Sports cars so what type of button magnet is OK? Can we use the standard Ninco or Fly button magnet? Does the magnet need to be located in exactly the same position for all cars? I ask because I think the non Sport versions do not have a provision on the chasis to locate a button magnet up front. If some like me do not like cutting holes in the chasis we could just glue the magnet in as long as we agree on its right location. While I am rambling one last question are we restricting this to Camaro's or are we including the Scalextric Mustangs as well? To answer your question on the magnets, they can be either sport button magnets or ninco button magnets. I'm not sure on the positioning of the magnets, but They will be in the front of the car somewhere, we will come up with basic rules for the cars and race and post them so that everyone knows what to do for the race. All Scalex Mustang's and Camaro's come with the mounting position for a button magnet as there is only one chassis mould for each car. We have driven both this way and found them to be similar. The Ninco 2mm magnets are the same size as the Scalex sport magnets so will fit in the pod. As for their strength we will be checking this over the coming weeks. As these types of races are teams races we are planning on mixing teams between experienced and non experienced racers so don't worry about who is a gun driver. We will make it as even as possible. Thanks you are right came home and had a look at my Mustangs and Camaro and they do have the mounting position up front for a button magnet. Thanks now I have mounted the button magnet taken my silicones off put back the standard rubber removed the rear magnet and now I want to give it a run. The misses will kill me. I am blaming you. Any other interested parties. Rally 2600 and Wovtam maybe. A nice drive down from the north. I have purchased my car for the race, the new boss mustang, which can be seen in the cars section, boslot has posted a picture of it. Done about 400 laps in it so far, with the button magnet only. Goes very well and is easy to drive. 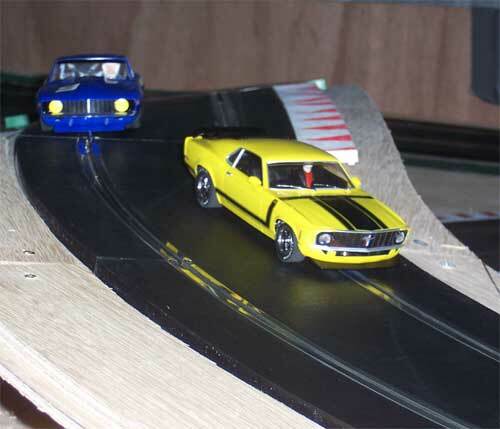 Here are a couple of pics of Michaels 1970 Boss 302 Scalextric Mustang with Sport magnet in place racing Jacob with my Sport Camaro with weight and no magnet. 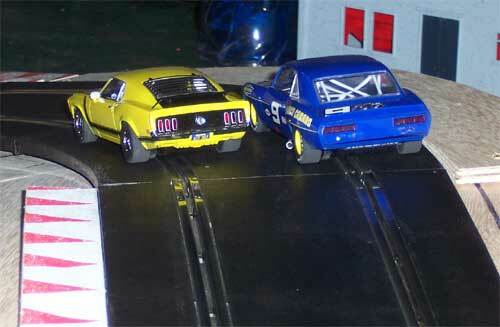 I also ran my non magnet stock Mustang with weight and all were within a couple of tenths. I know this is a raging debate but we have found the Sport Camaro to go no better than stock camaros and Mustangs and we would have at least a dozen versions of these cars now. The difference between front mag and no mag is nothing in times but they do feel different. This was also the first test of my new layout with some hastily layed borders to allow room to slide. Still a lot of work to do but the new dogleg section in double outer curves feels like routed track to drive. Can lift the rear wheels as the track dips away to the left. Good looking pics vince and a fast flowing track as well,looking forward to having a test Tran Am race on your new lay out . 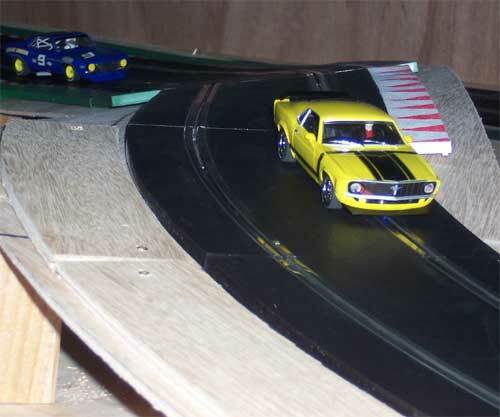 After giving the camaro's and mustang's a few test drives over the last few days, theyare very closely match in times, with the camaro's probably about 1 or 2 tenths quicker, and running them in a stock version with only the 2mm button magnet will mean even the novice slot car racer will not be disadvantaged in the race. We need a few more starters for the trans am race, so if your unsure whether you should race please come forward and add you name to the start list. Experienced drivers will be match up with begineers to make the teams format even. The race will be a great opportunity to have a good nights racing and meet some of the other members of the forum. Guys, is there an option to run with the magnet or run without and add weight? Devious Dave. Is anyone in Melbourne interested in doing something like this ? Do any of you guys want to give up on Ebay for a month and spend the money on a plane trip? Davenic do you know of anyone down your way with a suitable track for holding a race? Why don't you start a similar topic for a Melbourne race. Devious we want to make it as easy as possible for the beginners but we will do a comparison at Armchair very soon to see how close they are. Peter I will do an explanation in the thread for Emu Park but there was no rocket science involved. It was more to do with the base itself than the track. Maybe a good reason for the wife "but I needed it for the race" or "the entry fee was $60 and I got a free car"
The cars are great for the price and if you purchase them from Armchair Racers mention your a Auslot member and you will get a 10% discount. For those who want to do some Trans Am repaints Armchair Racer has the Scalextric kits for $9.99 each. The kit bodies fit straight on the slotcar chassis so any Moffat Mustangs or those like me who missed out on a Jane Camaro, these are nice and cheap. I will be getting a few.